As Ben Horne and Catherine Martell scheme, Josie plays detective. Truman and Cooper get leads about the mysterious man with one arm, and pick up his trail. Jacques Renault enters the equation, and Sarah Palmer describes her vision of Laura's killer. Scheduling: new episodes posted every Tuesday and Thursday. Both re-watchers and new viewers are welcome. Watching: available for streaming on Netflix, Amazon Prime, and for free on Hulu and CBS's site. 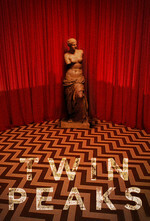 Bonus Stuff: Twin Peaks trading cards! With likes, dislikes and accomplishments. Memorable quotes. Notable locations. Significant objects. Collect them all! "I always wondered why everybody thought it was offbeat or strange. I've lived in the Northwest quite a while," he said. "That's how people are here. Every character they came up with, that was somebody I know." Yeah, Mike is great. Especially as the character develops. "I'm going to go give little Elvis... a bath," While holding up a, well, little Elvis. I've always wondered about that. The interior of the Twin Peaks High girls' bathroom: decorated by the same guy who worked on the Overlook Hotel. The first signs of trouble in Lucy and Andy's relationship, which I think is the start of a really sweet and fun side-story. Ugh, and Hank. Easily one of my least favorite characters in the show. Leo, keeping a shirt with blood all over it, with his name sewn into the collar! A low level hump, indeed. I could definitely do without the "women are mysterious, magical creatures" male bonding moment... but I guess it does sort of fit the characters. I love Audrey playing up to Ben's vanity. "You have to start to think about the future, Daddy, just like I am!" The close-up of the Tennis game before they raid Jacques' apartment... such a great little detail. Anyway, another peach of an episode. It moves all of the pieces around satisfactorily, furthers the investigation, and moves smoothly from scene to scene. What great story telling. My favorite scene from this episode is the non-sequitor poem from Deputy Hawk. Cooper and Truman fire six shots. Truman hits the button to return the targets. that you have known a singular joy. I wrote that about my girlfriend. I forget. Jacques Renault doesn't have an accent, does he? A Quebecois accent, I mean. I remember Bernard having a thick accent, don't remember about Jean. He does, a bit at least. I think the thing I remember the most is him saying "Bite the bullet baby," with a pretty thick accent later in the series. I don't think it's all that consistent. Do they really think that Jacques was the one who jumped out of that window and ran away? He's not the nimblest looking fellow. I don't remember noticing it before, but the vet's office bears the legend "Aid To The Beast Incarnate", which sounds like it might be a quote from something. Nothing I've found online gives a source other than Twin Peaks, so it must be an original. In any case, MIKE and BOB seem to both be demons of a sort, but the phrasing seems a bit high-flung and ominous for a small-town pet doctor. Notice that Philip Michael Gerard's sample case only contains right shoes, to go with his intact right arm. I don't think there's any other relevance, but it's an amusing detail. Up until now, I thought that Shelly might have known about Bobby's dealings with Leo, but it sure seemed like she was in the dark about Leo/Bobby/Mike's little cocaine ring. She clearly believed Bobby's frankly preposterous story that Leo was both transporting it and selling it at the high school, even though we know that it had to have been Bobby + Mike dealing it at TPHS. Coop's awesome eagle-eye: 4 shots in the eyes, and one in each nostril. Classic. Is the "SAY NO TO GHOSTWOOD" flyer posted at the diner the first time that name is referenced in the series? I don't remember it being named until Season 2, but it looks like the groundwork has been laid. Audrey: "Ever hear of One Eyed Jack's?" Donna: "Isn't that a western with Marlon Brando?"